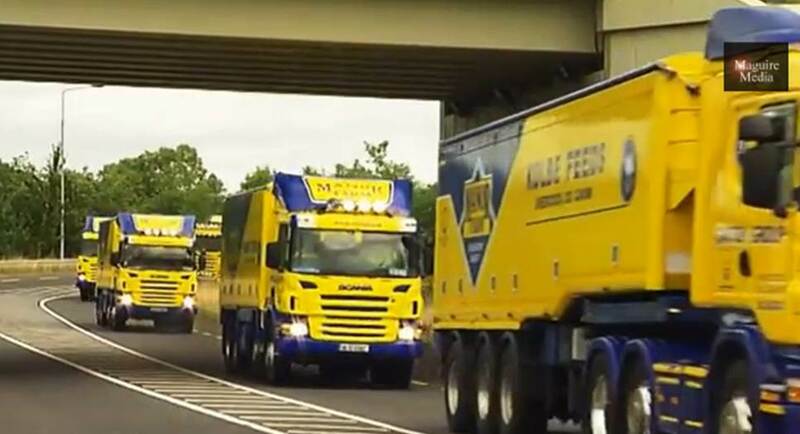 Congratulations to Jupiter Transport who won the Livery of the year award at the Fleet Transport Irish Haulier of the Year Awards. 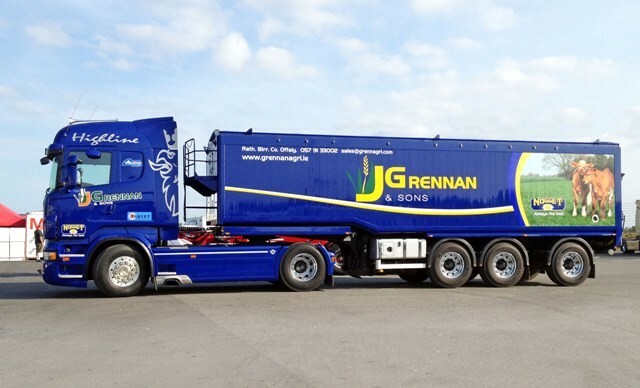 Two Muldoon Bulk Blowing Trailers collected two of the winning awards at the recent Mondello Truck Show held at Mondello Park recently. 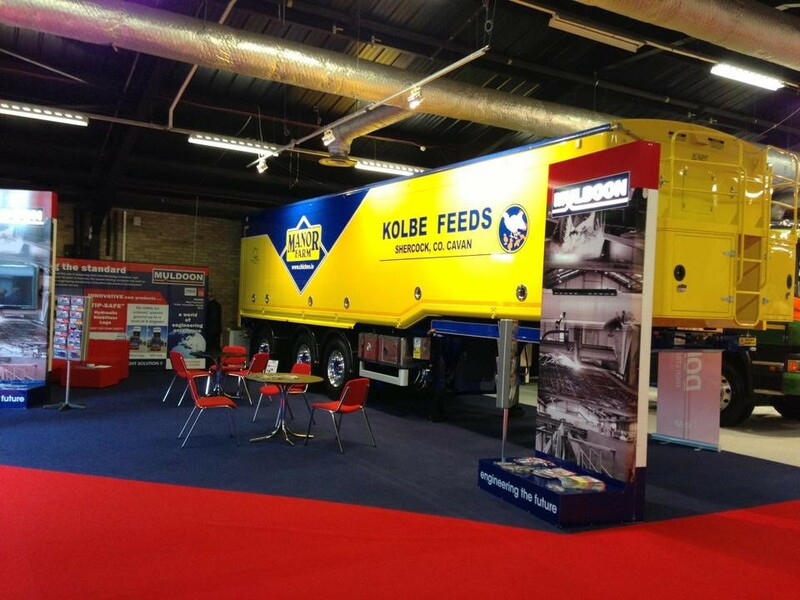 Following a very successful 2013 exhibition, we have recently confirmed our booking for Tip-Ex 14 which will be held at the Harrogate International Centre, Harrogate, Thursday 29th May - Saturday 31st May 2014. 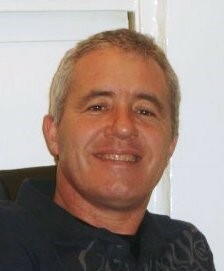 Neale Jones has recently joined our team as UK Business Development Manager. Recently, Muldoon became the first bulk blowing vehicle manufacturer to receive European Community Whole Vehicle Type Approval (ECWVTA) on our full range of products. As part of our strategy to meet increased demand for our products, we have recently acquired another site near our main factory incorporating a modern workshop with over 15,000 sq ft of workspace. 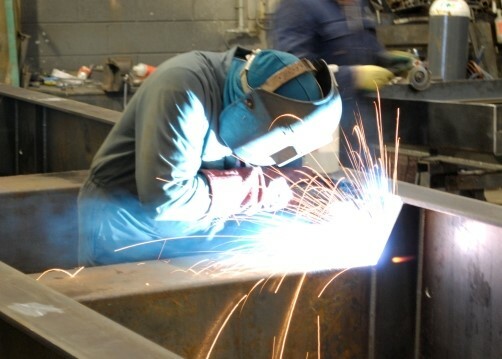 Muldoon have continued to export to high growth economies such as The Middle East, Africa and Asia. Check out our new online parts catalogue. A training scheme has recently got underway to allow school leavers to make their first steps on the career ladder. 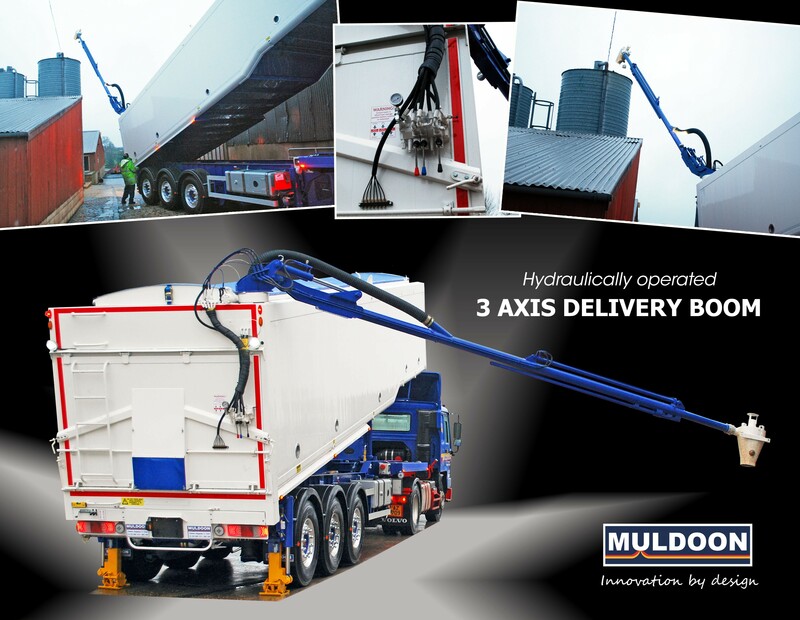 Muldoon recently designed and manufactured a new type of delivery boom for pneumatic delivery of animal feed to top loading bins. Muldoon offers a new product to ensure STABILITY and SAFETY whilst tipping. Muldoon recently were nominated for the "Trailer Innovation Award" at the IAA Commercial Vehicles Show in Hannover. 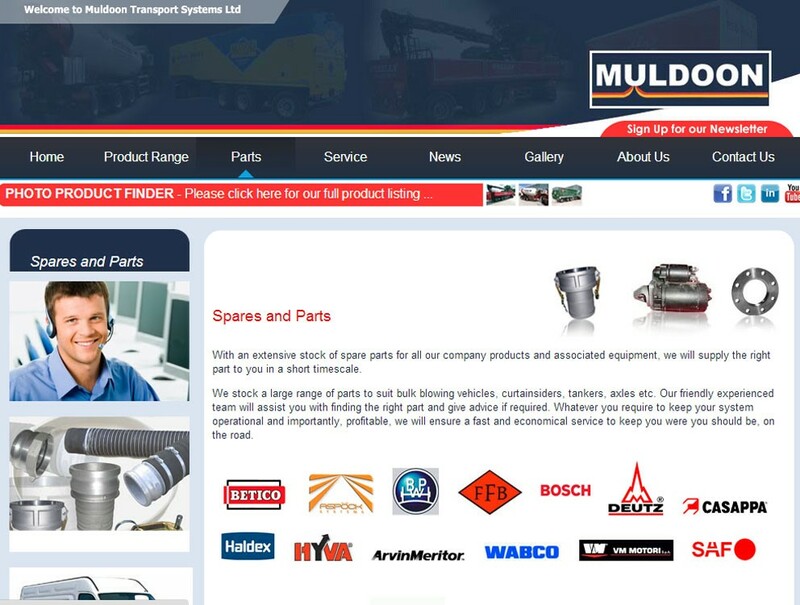 Muldoon recently won the prestigious award for Best Manufacturer at the Mid Ulster Business Awards. 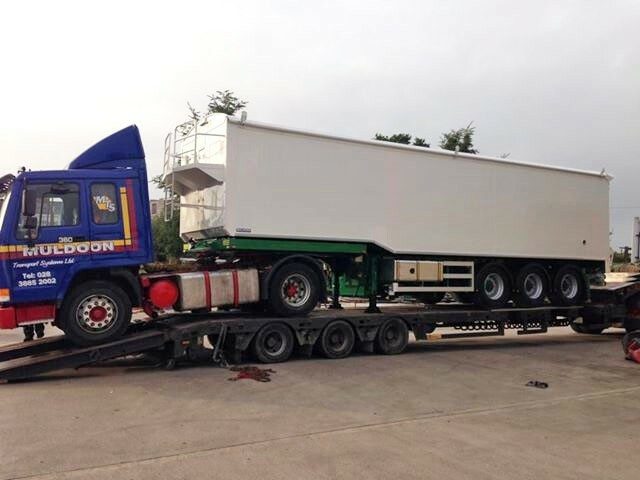 Muldoon welcomes the recent official announcement by the DFT to permit trials of Longer Semi-Trailers in the UK. With the advantages offered such as the ability to carry 15% extra per journey, reduction in CO2 emissions, less vehicles on the road, less fuel costs etc, this development offers massive benefits to businesses in the low weight distribution sector as well as to the environment. 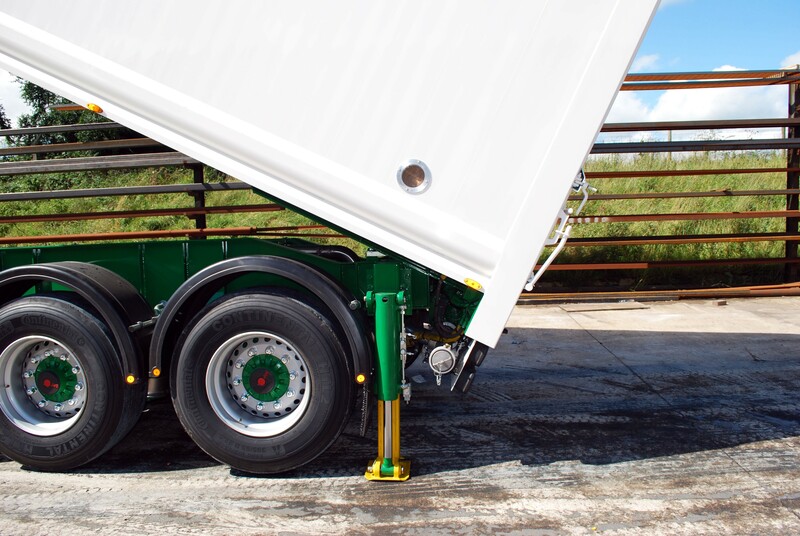 As part of the ongoing development of our Longer Semi-Trailer prototype, we recently have developed a kick out reduction system which can be fitted to any steer system to greatly reduce kick out on any longer type steer trailer. Muldoon Transport Systems recently attended the Fleet Transport Awards, held at the Crown Plaza Hotel in Dublin, where we were delighted to be awarded as winners the prestigious Trailer Innovation Award sponsored by Texaco Lubricants for our 15.65m Longer Semi-Trailer Development and our selection for the Trailer Innovation Award to be held at the Commercial Vehicle Show in Hanover, Germany.